Wasn't SSPF in the 2016 plus up? My background is in manufacturing operations, and I have no doubt that all suppliers in the SLS food chain would be able to meet whatever rate is needed. So don't worry about how many SLS can be produced, instead focus on how many SLS need to be produced - focus on the payloads and missions that can only be lifted by the SLS. Because it's never been about whether NASA can build an HLV, but whether NASA needs an HLV. There's enough money in the world to fly SLS at a much higher flight rate than it is designed for right now (0.5 to 2 per year). And I'm sure the people pushing hard for SLS are hoping on hope that they will get China to go to Mars or something and get that money (from the US Congress, not China... not directly, at least). Which isn't going to happen any time soon. Yes, nobody knows if the next or next but one president suddenly has an inspiration of putting a man onto mars before the end of the decade (whichever that is). And then it could be quite handy to have a HLV available. Because we currently see how long it takes NASA to develop one. Right. They essentially are building SLS on the slim hope of a new space race, which I think they'd even acknowledge is a fairly slim possibility. Thanks for this Scotty. I appreciate the correction to my thinking. I said "Cargo Processing and Preps", I said nothing about payload fueling or encapsulation. There are the AstroTech facilities for that. They also could do payload encapsulation in the old Shuttle Payload Canister Facility. But, there is no rush to modify facilities to do so, as there are no SLS Cargo Payloads on the books. Lots of "maybe" and "might happen", but nothing hard on the books at this time. I've not been here in a while. I saw the new SLS images and wonder why they changed the core stage color from that deja vu of Saturn V to the shuttle ET foam covered current look? The theory I've read most around here is that there never was a serious intention to paint the core stage white, but that it was shown that way in promotion materials to set it apart from the cancelled Ares V.
Using a simulation object with a ? as to its authentic size and placement of fittings as a fit check device of another set of equipment for an as yet created piece of hardware subject to changes (the SLS core) is not what I consider a good use of funds other than it could reduce the more obvious problems but none of the subtle ones. It is what you do if you are running behind schedule and you are trying to make up some time. The SLS core design is basically locked in now. Why would it change? There are always numerous, if relatively minor, alterations that occur to any design when metal starts being bent. Even going from one block version of a vehicle to the next block version generally introduces numerous minor alterations. 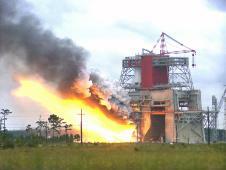 That said, it's not like this is unprecedented in NASA rocket programs. Recall that AS-500F was a full-scale mockup of the Saturn V vehicle, with all of the various connectors, plumbing leads, etc. that the real vehicle would have. It allowed for the hands-on verification of the pad systems as well as electrical connectivity tests between the GSE and the dummy vehicle. I don't believe that was wasted money. However, even with all of those fit checks and procedures training that occurred on AS-500F, it still took three weeks to get through a four-day CDDT on the first actual flight vehicle, AS-501. So, even with a dummy vehicle, nowhere near all of the learning curve was climbed working with the dummy vehicle. Similarly, the shuttle Enterprise (an actual flight-configured vehicle in terms of its plumbing and electrical connections) was used for similar pad check-out purposes, with a dummy ET and dummy SRBs, after the A&LT program wound down. And while that exercise was useful, there was still a lot of learning curve to climb when Columbia finally took its place on the pad to ready for flight. I guess my point is that dummy vehicles (mockups) have been a part of NASA development for half a century or more. And that such mockups are actually very useful, even after the design is pretty well frozen, to illustrate small changes still needed to the design (normally to interface positioning). But they have never been the be-all and end-all of figuring out how everything will fit and work together, both on the pad and in flight. So, the mockups aren't a waste of time or money, but by the same token they are not, and are never intended to be, completely identical to the real vehicles they are modeled on. And the mockups are only useful after the final design has been pretty well frozen, but before major flight hardware has been built, so you don't find that, despite the way the specs have been reviewed, the main oxygen inlet fixture is somehow three inches lower and slightly to the right of where the main pad oxygen inlet plumbing has been positioned to connect to it (as a made-up example). If the fix requires that the oxygen inlet on the rocket needs to be three inches higher up, then that change can be made on the as-yet-unbuilt flight hardware. It's an awful lot more difficult to react to such situations if you wait until you have your flight hardware all built and find that you need to go back and scrap half of your stages because the inlet connections are all in a bad place. Your only recourse at that point, really, is to kludge up the fittings in the pad hardware; enough of that and you have a bad, error-prone situation with your launch support systems. OK so these simulators are SOP for NASA and would be a normal part of any proposal and schedule for a NASA directed development. Thanks for the info. Like I said it is useful for the obvious and as you mentioned it is highly useful in discovering when a procedure is in error. Procedures are less sensitive to minor design changes but very sensitive to the order of tasks. many order of tasks problems are not evident until you try to execute the procedures. I just wanted to put some perspective on the entire SLS program. We are 18 months from the planned cryo tanking test, and 20 months from the "Green Run Hotfire" test of the entire EM-1 Core Stage on the B-2 test stand at Stennis Space Center. 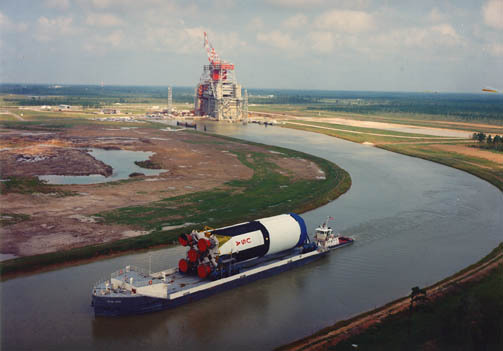 Image #3-Shows a Saturn-V S1-C 1st stage leaving Stennis bound for KSC for stacking and launching. Just imagine in early 2018, the EM-1 core stage will be making a similar voyage on the Pegasus barge. We are about to enter the 2nd quarter of 2016. Projects SLS and Orion are all coming together. I can hardly wait to see, hear and FEEL 4 RS-25s light off followed shortly thereafter by 2 of the largest rocket engines in the world. This is really happening, and launch day is rapidly approaching. Good work, and good luck to all those involved! On March 4, crew members ready a 900-pound steel beam to "top out" Test Stand 4697, which is under construction to test the Space Launch System liquid oxygen tank at NASA's Marshall Space Flight Center in Huntsville, Alabama. "Topping out" is a builders' rite traditionally held when the last beam is placed on top of a structure during its construction. The 85-foot-tall test stand will use hydraulic cylinders to subject the liquid oxygen tank and hardware of the massive SLS core stage to the same loads and stresses it will endure during a launch. The tests also will verify the models already in place that predict the amount of loads the core stage can withstand during launch and ascent. Prime contractor Brasfield & Gorrie of Birmingham, Alabama, and several of its subcontractors are constructing Test Stand 4697 and Test Stand 4693, which will have a twin-tower configuration and conduct similar structural tests on the SLS core stage's liquid hydrogen tank. Both stands are scheduled to be completed later this year. SLS will be the world's most powerful rocket and carry astronauts in NASA's Orion spacecraft on deep-space missions, including the journey to Mars. Has anyone here examined the possibility of an SLS first stage powered by AR-1 or BE-4 engines? Switching wouldn't change the timeframe that much, and it would drop the first stage cost by, oh...$200-250M, at a WAG. Sure would - the first stage engines are one of the most pivotal, complex elements of the whole LV. You switch those out and you have to change the whole design, especially when you're talking different fuel types. We're talking about a rocket that'd be as different as SLS is from Aries V. There's a reason why Vulcan is massively different to merely a "re-engined Atlas V" as some community elements conceived it would be. Structure, tanking, tolerances, thermodynamics, stresses, aerodynamics, everything changes, mass, acceleration on ascent, staging time, everything changes, everything must be recalculated, resimulated, reengineered, retested. You'd end up spending way more money than you'd save in infrastructure changes alone. If SLS was re-engined, it'd die. Boosters are a little bit different, but still a major element.